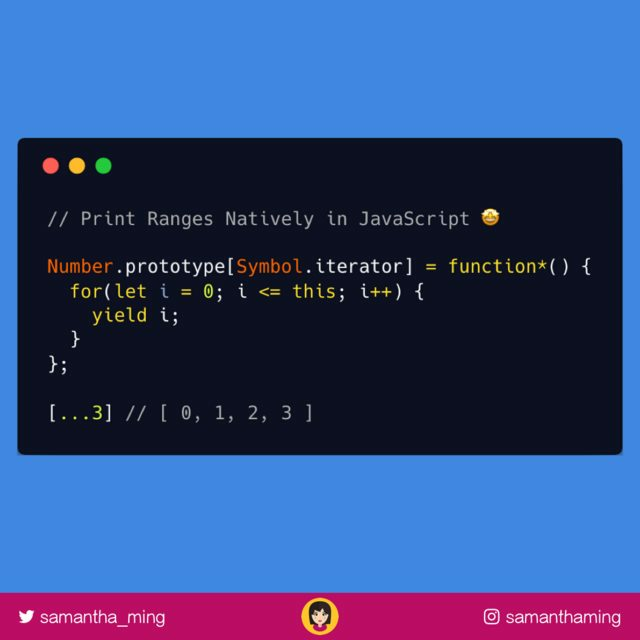 Add this snippet to print ranges in your number prototype! You can even apply your standard loop methods on it! Use it with the map method to triple each of the number. This code recipe does alter the built-in prototype. And this can lead to potential problem. A popular library call MooTools had an unfortunately incident known as #smooshgate. You can read this article that explained what happened. If you need custom behaviour, it's better to define your own method instead of changing a native one. That way you don't risk breaking anything at all. Improvement to build a specific range. I learned this from a course on Pluralsight. It's called ES6: The Right Parts from Kyle Simpson. It is a paid course, but I found a free transcript here.